It’s all about colour combinations, rather than a single accent colour. Apple green paired with chartreuse, rust, canary yellow and slate works so well in commercial interiors. At Design Junction the look was super edgy on stands like Pinch Design – paired with raw wood, leather and concrete flooring. And at 100% Design we saw a sharper, fresher take on the trend, where the colours were used on felt seating, carpet tiles and office furniture. We’re definitely seeing a shift towards warmer tones lately, a sharp contrast to the cool greys and neutrals that have been so popular in residential and commercial interiors. 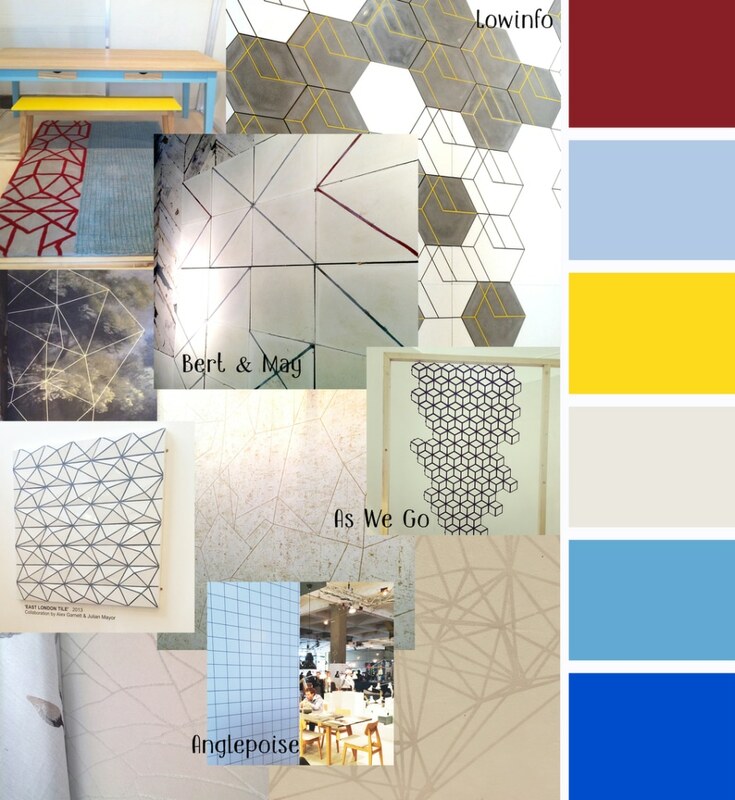 Tektura’s sampling department has a first hand insight into the new colour combinations and the key neutrals – and there’s definitely a lot more warm tones showing up. Maybe it has something to do with Instagram? Circles are the new shape of choice! Circular tiles, plates, hand illustrated designs, spots, round etched and embossed patterns, ceiling roses, hoops of light, globes… everything is curved, circular or spotted, from carpeting and wallcovering to acoustic panels and furniture. At Design Junction we loved the white dots painted directly onto the concrete walls and floors on the Mini & Dezeen stand. Richard Brendan’s new Speck ceramic collection is decorated with metallic dots, which emphasise imperfections. And our very own Helen Strevens, has launched a new hand drawn wallcovering design inspired by Fornasetti’s plates. Tiles feature heavily at all the shows we’ve been to, and it seems you can’t go wrong with this look. Hand crafted, hand painted, printed onto fabric or wallpaper, small panels or whole walls, distressed, shiny, metallic, matt… Colours are neutral and muted (think Instagram again) with a smattering of metallic. We’ve been admiring Smink Things’ abstract designs since we spotted them at Clerkenwell Design Week this summer. Their vintage influenced tile designs make a feature out of subtle imperfections. Bert & May are specialists in bespoke and reclaimed tiles and were hand-making tiles live at Design Junction, where they launched a new collection of geometric and distressed wood designs. A delicate new take on what we call the Tessellate Trend. Fine, trailing, hand drawn lines, which connect and create clever patterns. Often layered over photographic prints, and lovely when used to embellish raw materials such as wood and concrete. Colours are muted with splashes of brights here and there. At Design Junction Anglepoise’s stand featured wallcovering that looked like large-scale graph paper. As We Go showed a screen made up of intricate tessellating hexagon shapes at 100% Design, and we spotted rugs, wallcoverings and soft furnishings with self-coloured geometric patterns at Decorex. This refreshing colour scheme could be a reaction to the black and white geometrics we’ve seen so much of. Think white geometric walls with a scattering of citrus and tertiary colours in furniture and accessories. We saw variations on this theme in both commercial and domestic interiors. Dark midnight blue, deep navy, charcoal, chalky dark grey, and velvety black. Paired with marble, leather, gold and orange toned woods for an overstated glamorous look. More is more! And a stuffed bird from the curiosity cabinet would fit right in too! At Decorex we saw lashings of turquoise, sea green, duck egg and mint… with a splash of copper and raw wood here and there… and more teal velvet than you could shake a stick at! This time last year we talked about geometric textures, and the new generation is large scale, deeply textured patterns, often with a hand crafted, folded feel. Materials range from polished marble, plaster and wood, to felt, paper and leather. Still fairly exclusively in shades of white and grey. Written by Eleanor Cardwell, Marketing Executive for Tektura Wallcoverings.